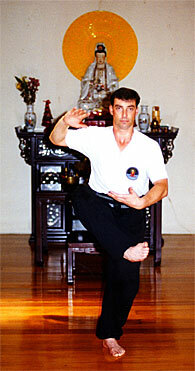 To explain Alan’s personal context of becoming and being an Inner Chamber Disciple of a traditional Gong Fu Master, especially a legendary Grandmaster [awarded the Honour of the title of ‘Living National Treasure’ during his lifetime by the Government of the Peoples Republic of China] requires some explanation. Mr Yap Cheng Hai, the First and most Senior and highly respected Inner Chamber Disciple of Grandmaster Chee Kim Thong [personally responsible for bringing Grandmaster Chee out of semi-retirement] was a person of great influence in the direction of Shifu Alan Tinnion’s martial arts development and relationship first as a student then as a Disciple, with Master Chee: a friend and guide who was always available to offer his experienced words of wisdom and counsel. In this tradition Alan was brought up over many years from the time that Grandmaster Chee first saw that he had great martial arts potential and was possessed of the correct attitude for learning.